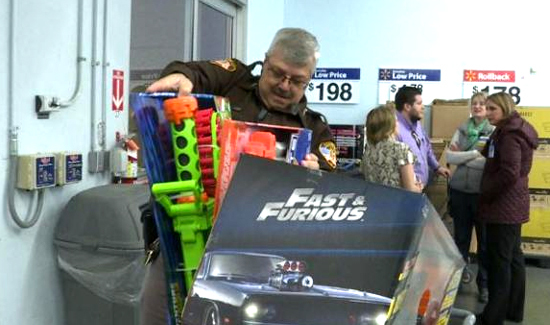 In Nebraska recently, local law enforcement officers in Sarpy County have been working hard to make sure that families around their community will have a merry Christmas. As a part of that effort, deputies joined community members and families for an annual Shop with a Sheriff event at the Gretna Walmart. Kids were thrilled as they raced around the store picking out toys and clothes their families might not be able to afford on their own. Chief Deputy Greg London says this is just one of the ways that the department gives back to their community. “I’ve done this more than once and it is really rewarding. I think we probably get more out of it than the kids do themselves,” said London.